The Makings of a Home Happy Hour. And a number of other high end wines for well below expected prices. Their liquor selection is equally varied. Well worth the trip! Watch for upcoming Hip Pocket Video on our very own home Happy Hour! I continue to visit McReilly’s and am now recognized by the bartenders. Soon, I may be able to consider myself a regular. This latest visit, I wandered in during a Yankees/Mets game. The place was raucous with friendly but pointed bar banter being tossed the length of the bar. I sat smack in the middle and watched the same two fellows that had a baseball debate go to town again. Great fun. The bartender even checked in with me to jokingly make sure I hadn’t come in for a quiet meal. I hadn’t. I got exactly what I came in for: a third place in full swing! 1. The perfect bar is everywhere. So go there. Leave nothing to chance, people: That place you’ve always walked by? Saunter in. Look around. Have some onion rings and ask the bartender what’s good here. Most of all - Enjoy Yourself. The Historian Speaks: Pub Culture. 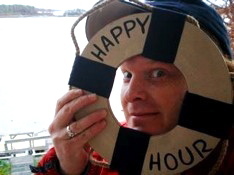 So many people have asked us, “How did you come up with the idea for Happy Hour”? Here’s a go at explaining it. I’ve always been fascinated by the “pub culture”, as I’ve referred to it; what matters is not so much simply a place to go and drink, but a place that serves and helps to create a community. Some time ago, I came across Kevin C. Kearns’ wonderful book “Dublin Pub Life and Lore” and was hooked (It’s a great read, I recommend it highly). Mr. Kearns had conducted interviews with a generation of old time regulars in Dublin’s colorful and disappearing pub scene. The world he explored of pintmen, publicans and oddball behavior had me hooked. But that way of life is fading: Why? Recently, I came across author Ray Oldenburg’s “The Great Good Place” which deals with why we need places like pubs, taverns, and café’s in our lives and communities. He calls them “third places” (our homes and work being the first and second) and lays out a convincing argument as to why we need a place free from the expectations and responsibilities of the first two. The cast of characters we meet at home and at work changes little, but the cast of a “third place” can change greatly. Also, in a third place we are free to be ourselves, or create a self we choose. Roles can be dissolved. A lawyer can sit elbow to elbow with a mailman, an artist, a student, a waiter. Roles we play on a daily basis can be abandoned and we are welcomed on new terms. Not all bars and pubs are third places. It takes more than a liquor license to create them. It takes character and characters; conversation and debate. It takes a willingness to be open and include newcomers while enjoying “the regulars”. Sadly, in our world now, these places are becoming rarer as we develop communities that make no place for a “local”. Subdivisions often create neighborhoods of people who share a zip code and little else, isolated in their homes without a third place to bring them together. And let’s not even begin down the road of the effects of corporate meddling on the independent pub owner. So Happy Hour came about, in part, to find some of these “third places” and tell their stories. We are the three good friends who want to tell you the stories of the people, the places, the drink and food that are more than just a pick up joint or a business expense. Places that create something unique, weird, funny, and meaningful. They say the best stories are true. There are countless Happy Hour destinations out there. We want to show you the “third places” you’ll tell your friends about. Maybe you’ll find your own local. Or maybe we’ll all just have some fun. Cheers!